It is ultimately up to the experimenter to understand their hardware and decide how best to configure it. For the most part, deciding on a hardware configuration will depend on 1) the capabilities required by the experimenter and 2) the limitations of the hardware. Wherever possible, we have avoided imposing any unnecessary limitations through the software (although there are a few). Below is an example setup which makes use of many of the current capabilities in ACQ4. Example hardware configuration for photostimulation experiments. ACQ4 records data and outputs stimuli to the MultiClamp channels via the DAQ. At the same time, the state of the MultiClamp is controlled and recorded via serial or USB interface and the “Commander” software supplied by Molecular Devices. In a typical configuration, each channel of the MultiClamp will use one analog output and two analog inputs on the DAQ board, but each of these connections is optional. The DAQ triggers the camera, telling it when to record frames. This is only possible with cameras that have a TTL trigger input to be driven by a digital output port on the DAQ. The camera triggers the DAQ, telling it when to start recording. This is only possible if the camera has a TTL output indicating that it has started acquiring frames. Most scientific cameras will at least have an output which indicates when frames are being acquired, which is sufficient for this purpose. This line should be connected to one of the PFI inputs on the DAQ to allow triggering. That takes care of starting the DAQ and camera simultaneously. In addition, we ideally want to know the exact time that each frame is acquired so they can be aligned correctly with other signals recorded on the DAQ. To accomplish this, the camera’s exposure TTL output must be connected to a buffered input on the DAQ board (digital input is recommended, but E-series boards do not have buffered digital I/O, so analog input would be required there). During synchronized acquisition, each camera frame will be automatically tagged with the exact time it was acquired. In the diagram above, the exposure TTL signal is connected to both PFI and DI lines on the DAQ. Depending on your camera, this can cause trouble because if the PFI line is not in use, it goes into a low-impedance state which may prevent the exposure signal being recorded correctly on the DI line. Solutions to this are 1) disconnect the PFI line when it is not in use, 2) always make sure the PFI line is in use by requiring that the camera trigger the DAQ, or 3) add some electronics in between to properly isolate the two input lines. Scan mirrors may be used in conjunction with one or more laser sources to do scanning laser photostimulation and microscopy. These require only the availability of two analog outputs from the DAQ board and digital or analog control of a Pockels cell, shutter, Q-switch, or some combination of these. 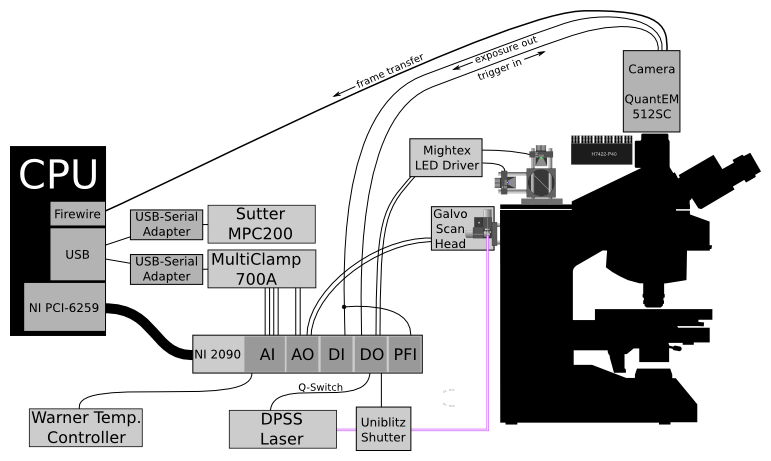 In the diagram above, a Zeiss Axioskop FS2 has been modified for use with scanning laser input. ACQ supports the use of the Sutter MPC200 for stage control and position readout. This position information is used in several modules to track the movement of the sample relative to cameras and laser scanning systems. Stage control may also be used to automate the acquisition of tiled image mosaics. The MP-285 is also supported for this purpose, but with one caveat: this device is often controlled by a 2 or 3-axis rotary input device. If the computer attempts to read the controller position at the same time the wheel input is in use, it will crash the controller. This is a limitation of the MP-285 which can be worked around with the addition of a custom microcontroller (see lib/drivers/SutterMP285/mp285_hack). Another option exists for the intrepid-adventurer type (or for those looking for less expensive options). Many electrophysiology stages are controlled by manual micromanipulators. It is possible to read the position of the stage by attaching some variety of rotary encoder to the micromanipulators. A simple option is to use the hardware from a serial mouse to accomplish this task, and ACQ4 supports the use of serial mice as positioning devices. Similarly, an arduino board fitted with rotary encoders could be programmed to output serial mouse protocol.